Forgive us for starting with a less-than-complimentary comment to our seventh annual Readers’ Choice Awards balloting. While the above comment from Tres Wood, manager of packaging services at a pasta company, does represent many people’s sentiments, the good comments about suppliers outnumber the bad ones by about nine to one. But the economy no doubt factored into vendor responsiveness in late 2008, even as it affected the voting of our 200-plus respondents, who were asked to pick their favorite suppliers in 21 categories of ingredients or 21 categories of equipment and services. That may be the real effect of the economy: suppliers trying harder. “The worse the economy gets, the better the service gets,” wrote Dave at a cheese company. Our survey was taken in late November and December when the recession was in full bloom, but perhaps the bottom hadn’t yet been hit. We sent e-mails to a subset of our circulation list directing them to the online survey form. There are two separate surveys: one for our subscribers primarily involved in specifying processing and packaging equipment and services, a separate one for those buying ingredients and flavors. The winners in 11 categories of wellness ingredients will be named in the April issue of our sister magazine Wellness Foods. Actually, looking back at last year’s report, “tough economic times” painted those comments too. Even though things got worse toward the end of 2008, the ratio of positive comments to negative ones was higher this year than it’s ever been in this survey. “Customer service is often more important than price,” adds another respondent. “All of the companies that we work with have excellent customer service,” writes another. Approved vendors lists provide comfort for most. “Service from our preferred vendors is usually very good, or they would no longer be on our vendor list,” writes Fred at a Midwestern cereal company. But there’s always room for improvement. One respondent wrote: “They need to focus on regulatory responses when hot questions arise (melamine, allergens, etc. ).” Another respondent added GMOs to a similar list and comment. Service “has slipped as of late with regard to equipment reliability, customer service and overall.” “Customer service is marginal, returned calls on product information are non-existent.” “We need more quality organic suppliers,” writes one. And some are always on the prowl. “Overall I am satisfied,” writes an equipment buyer in the Atlanta operation of a large food company, “but I am open to trying other companies.” Anybody want her number? That’s what this list is all about. While our hats are off to the 101 companies named on the following pages, you readers can use it as a yellow pages for new suppliers. 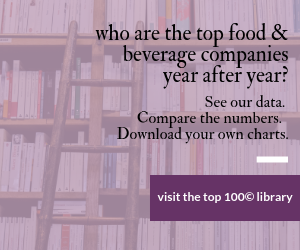 Thanks to all the food & beverage processors who responded to our survey. Congratulations to the three people who won our $100 enticement. Keep notes — we’ll ask your opinions again next year.